Sonia had purchased this product on one of her solo TJ's runs, so it was a surprise when I found it on the kitchen counter. "What are these Ticama Sticks?" I asked. 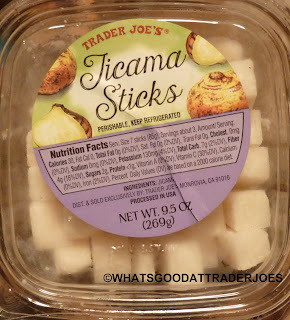 Just then, I noticed it said "Jicama Sticks," with a "J." I had been thrown off by the peculiar font TJ's chose. So I re-phrased my question to: "What are these Jai-camma Sticks?" butchering the product name like a true 'Murican. Sonia's reply came back with the correct pronunciation. "Oh, the Hee-comma Sticks? They're really good! I used to eat these growing up. My mom would give them to me when I was sick." They're basically just run-of-the-mill root vegetables, similar to radishes or turnips, but sliced into long, narrow sticks. When you Google the phrase "jicama tastes like," the top two auto-fill choices that pop up are "like apple" and "like dirt," a not so subtle clue that there may be two distinct camps when it comes to jicama appreciation. I'll agree the texture is very similar to a fresh, crisp apple, but I must admit, when it comes to taste, I fall squarely in the "tastes like dirt" category. I can appreciate fresh root vegetables: potatoes and carrots are great, radishes are nice in salads, and even beets have their place, but jicama? Meh. Not for me. Sonia loves it, though—at least most of the time. Must be a Latin/Hispanic thing. I'm a fan of almost anything with a few drops of lemon juice and a dusting of chili powder, but even that combo couldn't redeem these things in my humble opinion. 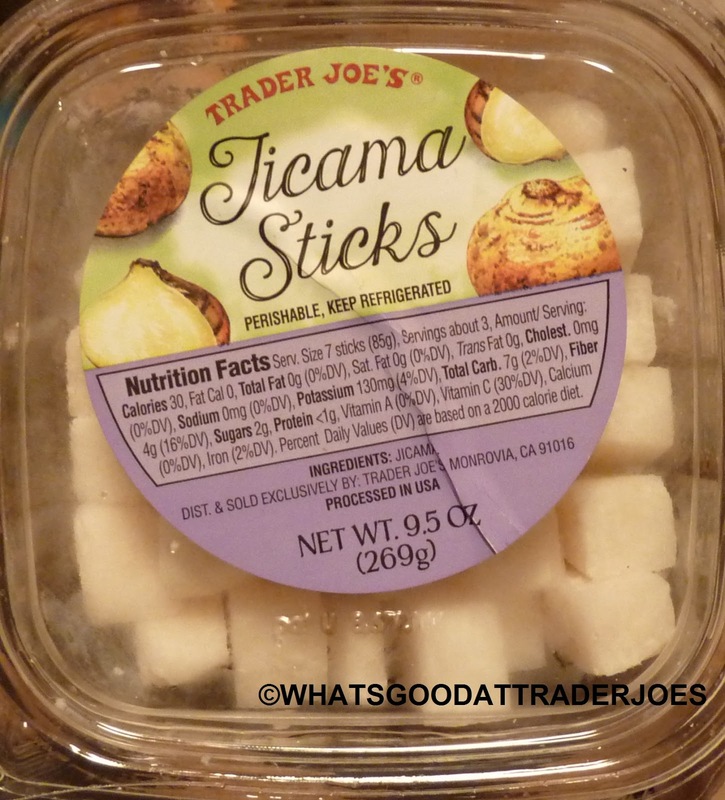 Sonia describes jicama sticks as "nutty and lightly sweet." She's got a great imagination when it comes to jicama apparently—although she did dock some points in this case because Trader Joe's selection was "not as sweet as the jicama (she) grew up on." Sonia's going to go with a 3.5. Even though they're not the greatest representation of jicama, she's quite impressed that TJ's carries them at all. I'm tempted to go with one star, but I'll go with a 2 since they're healthy and nutritious, cheap and convenient. The female half of the pittsburgh crew really liked these!so did the preschooler. We are in the apple camp. As Russ would say, "More for you, then!" I love jicama but don't always have good luck with these. I've found if you rinse, dry on paper towels, and cut into smaller pieces, like matchsticks, they're really good. A little sweet, crunchy, and nut-like flavor. I prefer buying a jicama and cutting my own for best flavor. Fresh jicama is the way to go - lots of international market stores with produce sections have them. When I was in college, there was this great veggie sandwich at a deli on campus with a jicama slaw. SO GOOD. All grocery stores around here sell whole jicimas. They're cheap and stay crispier when not cut up. It makes a good salsa, it can be stir fried and it's good roasted to bring out the sweetness. 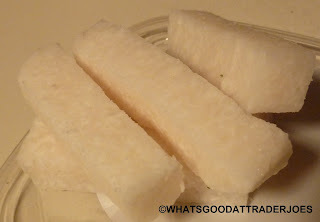 I love jicama and buy it whole as often as i can - fresh cut it's like a more juicy mild radish. I bought these at trader joe's a while back and they suffer from being pre-cut, not very flavorful and kind of dried out. Jicama is delicious in salad or slaw. I don't usually eat them solo. A few years back my husband and I dined at our first truly fancy restaurant - Topolobampo in Chicago. They serve a complimentary guacamole at the start of the meal but with cucumber and jicama chips rather than tortilla chips. It was quite good and a handful of times since then I have bought jicama when I was also buying guacamole ingredients. It's a nice combo. So good! It's like a savory apple. I dip in the Kalamata Olive Trader's Joe Hummus. Yummy!